We are finishing up week #4 and man, have we been busy! Little E has been working...and playing so hard and has really gotten into learning this week. I think she is finally "getting it"!!! I have caught her even asking, "Today, I have school time?" or "I have my school before I play ponies?" The first few weeks it was a rough start to getting both of us on any kind of schedule and I seemed to be having to really coax her to get interested enough to sit and practice any type of worksheets...before the "fun stuff". I was lucky the first few days just to get her to sit long enough for me to read and explain the paper to her before she was...done and ready to play. 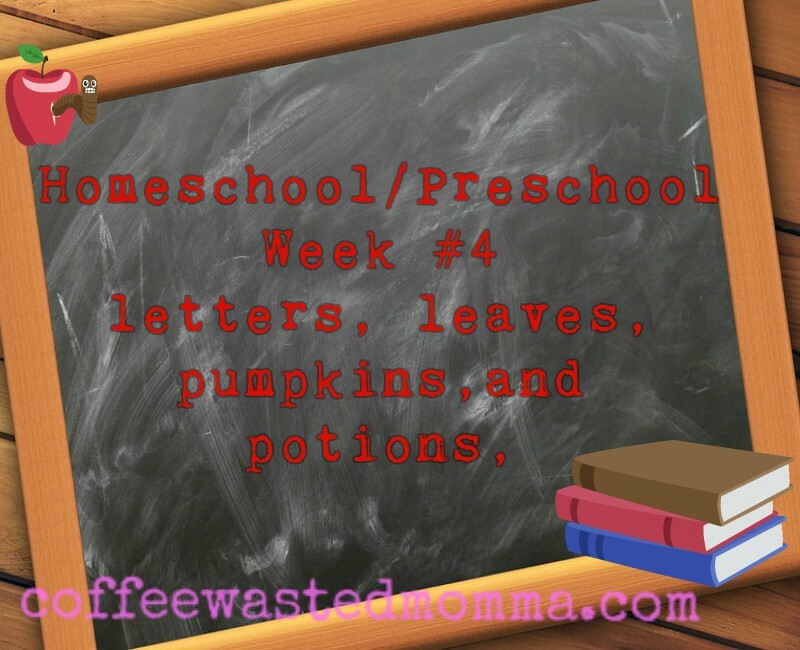 As the weeks have moved on and we are learning together when is our best time to do school and she is learning more of a structure, it has gotten easier. We started more of our Autumn/Fall theme. I printed of more Fall Trees! She really loves those! 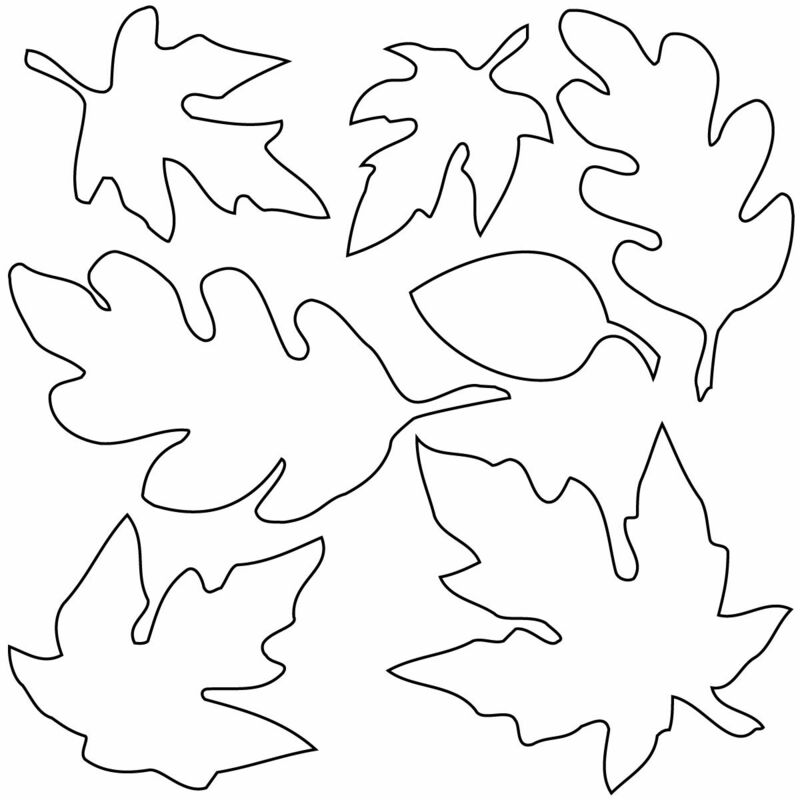 I also found a few other free printables of pumpkins and leaves. We painted our pumpkin and gave him some "googly eyes" for fun. We used the leaves paper to practice our "Fall colors" and learn how each leaf is different(like snowflakes and clouds). We painted them and when some of the colors ran, she loved that! She kept telling me, "I made rainbow leaves!" 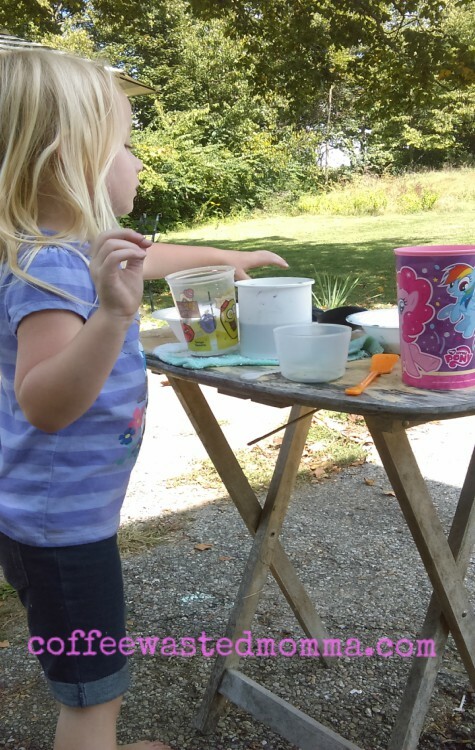 Now, this got a bit messy, so I am still looking for "neater" ways to do this little experiment, but it did teach her about colors, blending, and it was a fun, outdoor activity we could do together. I gathered a few random(luckily they weren't our "good" dishes) cups, bowls, and a spoon. 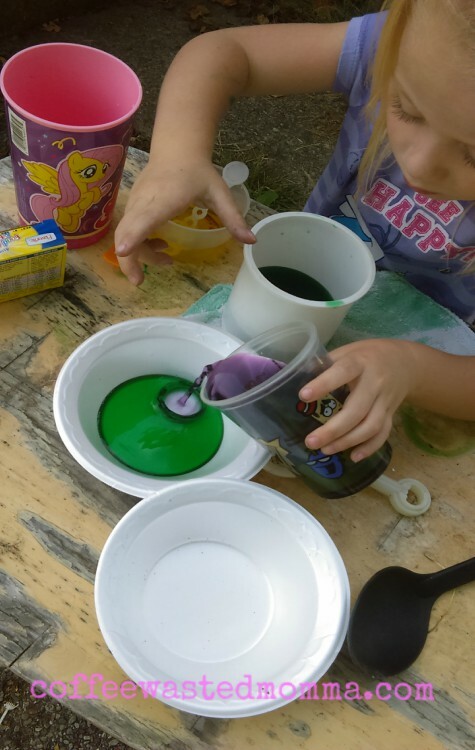 We added water to a couple and then we squeezed in a few drops a TON of food coloring. blue, green, yellow, and somehow we had a purple neon one. I had her name each color and see how less dye made it lighter, more dye it got darker. Then we would "make a potion" by pouring one color(blue) into the cup of yellow water and see what color it made. I did have her try to guess what color it would be. She guessed, "Pink!" every time! She had so much fun and did her best "Whaa ha ha!" witch voice throughout the whole day. The letters A and C this week. We are struggling a bit with A. I'm not sure why, but she just hasn't gotten it yet. C, we are doing much better on. It helps that we have Caralyne, Caden, Carter, Catalina, and a Chloe in our family, so we have been going over and over all the C names this week.She has identified it, practiced writing or tracing and making her best /K/, /K/, /K/ sound all week! We even found a Youtube video of the official... Letter C Song. 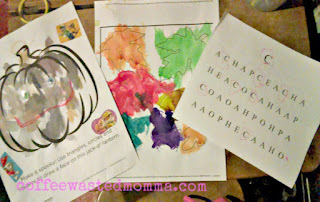 Let me warn all my dear Mommas, it gets very...annoying, very quickly, but it really does teach them a ton all about the letter. There is a song for each letter of the alphabet. A song and video that averages about 3 minutes, about all 26 letters! I hope you all have had a great and educational week and enjoyed our adventure recap! We'd love to hear about everyone's week! Have you started a Fall/Autumn theme? What are your favorite ways to teach?